We are currently accepting applications for the USDA-NNF Fellowships in Nutrition & the Gut-Brain Axis for new doctoral students to start Fall 2019 or 2020, see below for more information. 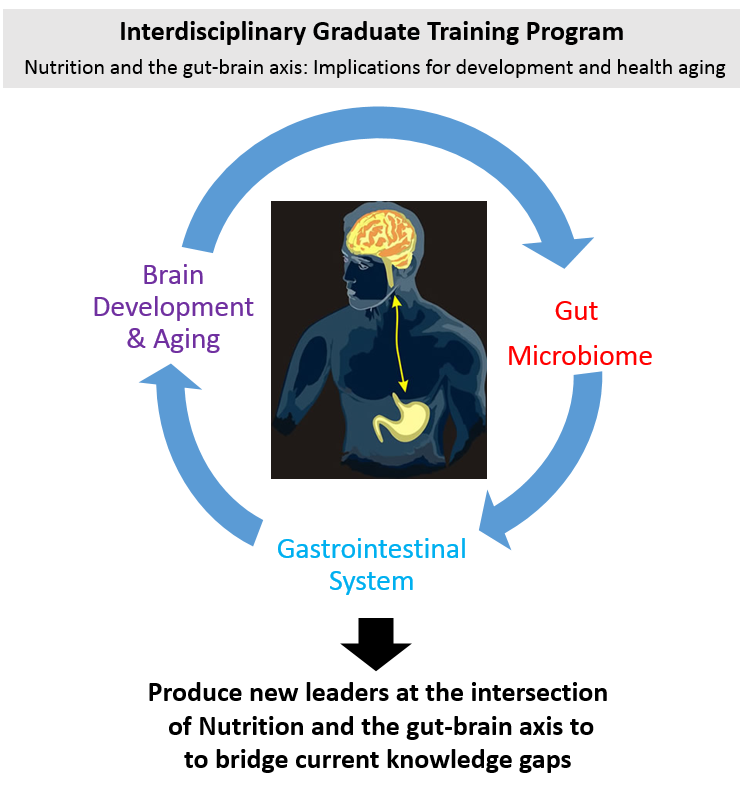 The Nutrition & the Gut-Brain Axis predoctoral training program at the University of Illinois Urbana-Champaign is an innovative research-based experiential training program within the Division of Nutritional Sciences that is designed to bridge current gaps in the workforce. This training program is funded by the USDA’s National Institute of Food and Agriculture (2019-38420-28973). The brain and the gut are intimately linked through bidirectional communication that includes sensory and motor neuronal connections, circulating hormones, and immune factors. Additionally, studies have shown the importance of gut-microbiota in this interaction, through signaling from the gut-microbiota to the brain and from the brain to gut-microbiota, which illustrates the complexity of the gut-brain axis. The gut-brain axis can be modulated by probiotics in animals and adult humans, but little research has focused on the broader impact of dietary components across the lifespan. The University of Illinois has strong multidisciplinary research centered on nutritional modulation of the cognitive function across the lifespan. Faculty in this program have well-established research programs focusing on aspects of the gut-brain axis and are ideally positioned to train the next generation of leaders in this rapidly emerging area. Why Division of Nutritional Sciences at the University of Illinois? We are ranked as one of the top 5 nutritional sciences graduate programs in the US in the most recent National Research Council assessment of doctoral programs. We provide an interdisciplinary graduate training program in nutritional sciences with extensive research opportunities ranging from the genome and proteome to clinical and population-based studies. We are recognized as a top graduate program on campus by the Graduate College at the University of Illinois. We provide a robust professional development program for the students with many opportunities including grant writing, teaching, career development, travel awards, research awards, and interactions with top nutritional sciences leaders through our seminar series and symposium. Applications are currently being accepted. Visit the Division of Nutritional Sciences page for more information on how to apply.